From the railway's beginnings, the station building, itself, had civic importance greater than ordinary structures. Let historian Brian Solomon show you how beautifully it filled that role. 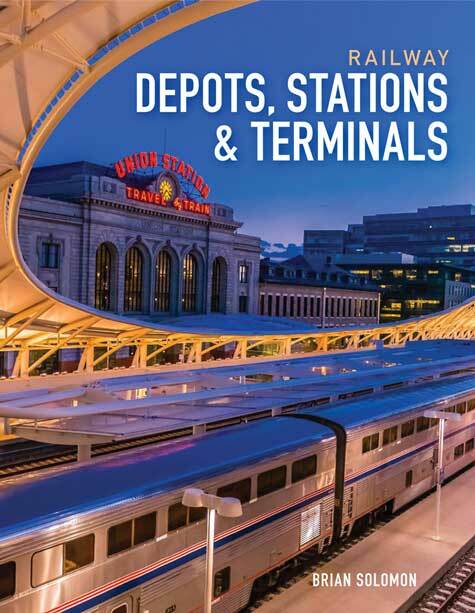 Railway Depots, Stations & Terminals is a unique book about some of the finest, most interesting, and most famous railway stations. Contemporary photographs, historic images, and postcard views provide an in-depth look at the architectural gems that dot the railroad landscape. The railway station has a special role in people's lives. Stations have served as the gateway to the world's great cities and the point of contact for remote towns. The inherent nature of the station is different from that of other buildings; it is an entrance, an exit, a place to rest, and a stop along the way. It can be the first thing a traveler sees and the last memory of a favorite city. Facing both the street and the tracks, the station is naturally a point of departure and a face of the city it serves. Brian Solomon, one of today's most accomplished railway historians, leads you through a one-of-a-kind exploration of the history and architecture of depots, stations, and terminals. Hardcover, 176 pages, 8 1/2 x 11", 157 color & 30 black and white photos.